While there is much to love about the fall and winter, one unwelcome aspect is the arrival of cold and flu season. Even if you are able to avoid a nasty bout of the flu, common cold symptoms can linger far longer than we would like. Do you ever feel like you’ve mostly gotten over a cold in just a few days, but can’t seem to shake the sinus discharge, nasal congestion, sinus pressure, headaches, coughing or irritated throat? These symptoms (as well as others) are often due to a sinus infection caused by a viral or bacterial infection that persists. Most sinus infections go away after just a few days, but others can last a month or more and have the potential to spread. Rarely, serious cases can even cause additional infections to other places in the head such as the ear, throat, and the lining of the brain. There are serious medical reasons to address sinus infections before they become a major problem but, wouldn’t it just be nice to minimize the days you have to put up with such uncomfortableness? The good news is that the health community is discovering more each day about a currently little-known natural supplement, called colloidal silver or nanosilver, which is known for its powerful antiviral and antimicrobial properties. Colloidal silver kills fungi, viruses, and bacteria, such as the resilient Staphylococcus aureus (S. aureus) that causes various skin and soft tissue infections; this includes, but is certainly not limited to, sinus infections. Sinus infections are caused by an inflammation or swelling of the tissue that lines the sinuses. Sinuses are supposed to be filled with air but, when the drainage passageways get blocked, the sinuses can become stagnant and filled with fluid that allows for germs to thrive. This is exactly the kind of environment in which bacteria can strengthen and multiply. What starts out as a viral common cold may end up as a bacterial infection. The best solution is to have a safe, effective, natural solution on hand that can neutralize bacteria growth when problems arise. Colloidal silver is the term for a supplement that consists of microscopic metallic silver particles suspended in a liquid (typically deionized water). These particles are too small to be seen by the naked eye. Ancient Greeks and Egyptians used silver for everything from keeping water fresh to treating wounds. Modern science tells us that silver ions are indeed powerful antimicrobials. Research from various journals, including Catalysis Today, explains how silver kills bacteria by absorbing the oxygen molecules they need. Without oxygen, the bacteria cannot take in nutrients and turn them into energy called adenosine triphosphate (ATP). Further, the process of DNA replication of the bacteria is hindered, preventing its duplication and spread. Viruses react to silver in a different manner. In most cases, colloidal silver blocks viruses from binding to and penetrating the body’s cells, although the exact mechanism of the action can vary from virus to virus. Various studies, including a comprehensive review published in Molecules, note how colloidal silver has been scientifically demonstrated to be effective against hepatitis B, herpes simplex, respiratory syncytial, influenza, and monkey pox viruses. Silver has been shown to combat fungus as well. The Journal of Microbiology and Biotechnology published a study that looked at colloidal silver’s effectiveness against the Candida and Trichophyton species of fungus (which cause everything from yeast infections to athlete’s foot) and found that the silver particles were as effective as some of the most common and powerful prescription antifungal drugs available. Depending on the kind of fungus, colloidal silver either prevents the fungus cells from growing and reproducing or affects the fungus cell’s walls; causing the contents of the fungus cells to leak out and the cells to die. A study from International Forum of Allergy & Rhinology, looked specifically at those who suffer from chronic sinus infections. It noted how common treatments (such as topical nasal steroids, long-term antibiotics, and even surgical options) are often ineffective because they don’t address the presence of S. Aureus bacteria in the nasal tissues. The researchers found that colloidal silver, at relatively low doses, significantly reduced the amount of S. Aureus when compared to those who used a similar solution that did not contain silver. In addition to being host to various kinds of bacteria, the sinuses also contain fungi that thrive on mucus. Recent research, published in Journal of Microbiology and Biotechnology, found that many sinus infections are actually caused by fungi that colloidal silver is effective at treating (unlike most other treatments). A different study from International Forum of Allergy & Rhinology verified that colloidal silver is effective as a treatment for chronic sinus infections and also investigated the safety of the treatment. After all, if silver is deadly to bacteria, viruses, and fungi, could it be harmful to other substances in our body as well? Fortunately, the study found that blood counts for silver were normal in those who were treated and all other parameters that were measured appeared to be standard as well. This led the researchers to conclude that colloidal silver appears to be effective and safe at recommended dosages, but it’s always best to follow the advice of your healthcare practitioner. A condition called argyria, in which the skin turns blue or bluish-grey, is extremely uncommon but the risk of it goes up when colloidal silver is used in excessively high doses over a long period of time or if the colloidal silver product that is being used is of poor quality. This is why it is important to always follow dosing guidelines and to know that the supplements you put into your body are of the highest quality. Antibiotics are commonly prescribed to those with sinus infections but, while they can be effective in some cases that are bacterial alone, they come with some significant side effects and limitations. For instance, some types of sinus infections are caused by fungi that are untouched by antibiotics. Antibiotics are also commonly accompanied by unpleasant side effects like diarrhea, cramps, rashes, and even allergic reactions. Additionally, widespread (often unnecessary) antibiotic use has led to bacteria becoming more resistant to them, so anything people can do to limit their use of these medications is helpful. Did you know that, in September 2016, the FDA announced the ban of many antibacterial soaps, saying that their benefits are not outweighed by the potential health risks? The use of colloidal silver is a good first step alternative to antibiotics. Just like an antibiotic, colloidal silver is only meant to be taken every day for a short duration of time as a tool for dealing with various kinds of infections. 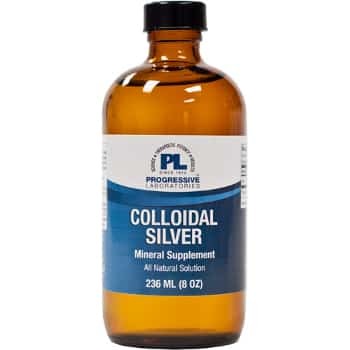 Progressive Labs makes a great option simply called Colloidal Silver. This supplement uses extremely small particles of silver (sub-nanometer – 0.65nm size), which makes it more effective than some cheaper, lower-quality versions that use bigger particles. Colloidal silver products are often compared through measurements of their particle surface area. The particle surface area increases as particle size decreases. This makes sense if you imagine two equal-sized bottles where one has millions of tiny particles of silver and the other one has 3 big chunks of silver. Which one will have more silver to measure on its surface? The answer is the one with the millions of tiny silver particles. Although Progressive Labs’ Colloidal Silver says that its users can simply take one teaspoon daily (mixed with water or juice, if preferred) or even apply it directly to the skin, utilizing a neti pot, to create a colloidal silver nasal flush is an option that many of my patients swear by. A neti pot is a commonly-found container that is designed to wash debris or mucus from the nasal cavity. To try this approach, dilute ¼ teaspoon of colloidal silver into ½ cup of lukewarm water in the neti pot, bend over the sink, and turn your head to the right while putting the tapered end of the neti pot in the right nostril. Pour the solution through the nasal cavity (in the right nostril and out through the left nostril and into the sink). Flush the sinus for 15 seconds on one side before switching over to the other side for another 15-second flush. Allow the water and colloidal mixture to flush completely through the nasal cavity and blow your nose after to ensure extra moisture gets out of the sinus. Always remember to only use bottled water that has been distilled or filtered water when utilizing a neti pot. The FDA has warned against the use of contaminated water with neti pots, which seems obvious. Another option is to get a colloidal silver nasal spray, such as Silvercillin Spray by Designs for Health, and apply about 6 sprays a day directly to the sinuses. This option is the form of treatment that many colloidal silver studies have used when verifying colloidal silver’s effectiveness at addressing sinus infections. It is much easier than the neti pot method and can be kept in your purse or desk drawer. I hope this article is helpful and provides you with information on effective and natural methods for addressing sinus infections. No one should have to suffer longer than you have to or resort to medications than can cause more harm than good. If you have any questions regarding the concepts discussed here or anything else, you can reach our customer service team at 888-460-3091 or e-mail them at customerservice@oakwaynaturals.com. Colloidal Silver is considered to be the most universal antibiotic substance that for all practical purposes is non-toxic to humans in its micro-concentrations. There is no known disease-causing organism that can live in the presence of even minute traces of the chemical element of simple metallic silver. The particles are electrically charged to activate the germicidal quality of the silver and allow the particles to remain suspended in the solution of deionized water. This mineral provides nutritional support for general health. The good news is that the health community is discovering more each day about a currently little-known natural supplement, called colloidal silver or nanosilver, which is known for its powerful antiviral and antimicrobial properties. Colloidal silver is the term for a supplement that consists of microscopic metallic silver particles suspended in a liquid (typically deionized water). Research from various journals, including Catalysis Today, explains how silver kills bacteria by absorbing the oxygen molecules they need. Without oxygen, the bacteria cannot take in nutrients and turn them into energy called adenosine triphosphate (ATP). Further, the process of DNA replication of the bacteria is hindered, preventing its duplication and spread. Viruses react to silver in a different manner. In most cases, colloidal silver blocks viruses from binding to and penetrating the body’s cells, although the exact mechanism of the action can vary from virus to virus. One study noted how common treatments (such as topical nasal steroids, long-term antibiotics, and even surgical options) are often ineffective because they don’t address the presence of S. Aureus bacteria in the nasal tissues. The researchers found that colloidal silver, at relatively low doses, significantly reduced the amount of S. Aureus. Recent research, found that many sinus infections are actually caused by fungi that colloidal silver is also effective at treating (unlike most other treatments). The Journal of Microbiology and Biotechnology published a study that looked at colloidal silver’s effectiveness against two specific species of fungus (which cause everything from yeast infections to athlete’s foot) and found that the silver particles were as effective as some of the most common and powerful prescription antifungal drugs available. A separate study investigated the safety of the treatment. After all, if silver is deadly to bacteria, viruses, and fungi, could it be harmful to other substances in our body as well? Fortunately, the study found that blood counts for silver were normal in those who were treated and all other parameters that were measured appeared to be standard as well. This led the researchers to conclude that colloidal silver appears to be effective and safe at recommended dosages, but it’s always best to follow the advice of your healthcare practitioner. Antibiotics are also commonly accompanied by unpleasant side effects like diarrhea, cramps, rashes, and even allergic reactions. Additionally, widespread (often unnecessary) antibiotic use has led to bacteria becoming more resistant to them. The use of colloidal silver is a good first step alternative to antibiotics. Just like an antibiotic, colloidal silver is only meant to be taken every day for a short duration of time as a tool for dealing with various kinds of infections. Although Progressive Labs’ Colloidal Silver says that its users can simply take one teaspoon daily (mixed with water or juice, if preferred), utilizing a neti pot, to create a colloidal silver nasal flush is an option that many of my patients swear by. Allow the water and colloidal mixture to flush completely through the nasal cavity and blow your nose after to ensure extra moisture gets out of the sinus. Always remember to only use bottled water that has been distilled or filtered water when utilizing a neti pot. I hope this article is helpful and provides you with information on effective and natural methods for addressing sinus infections. No one should have to suffer longer than you have to or resort to medications than can cause more harm than good.